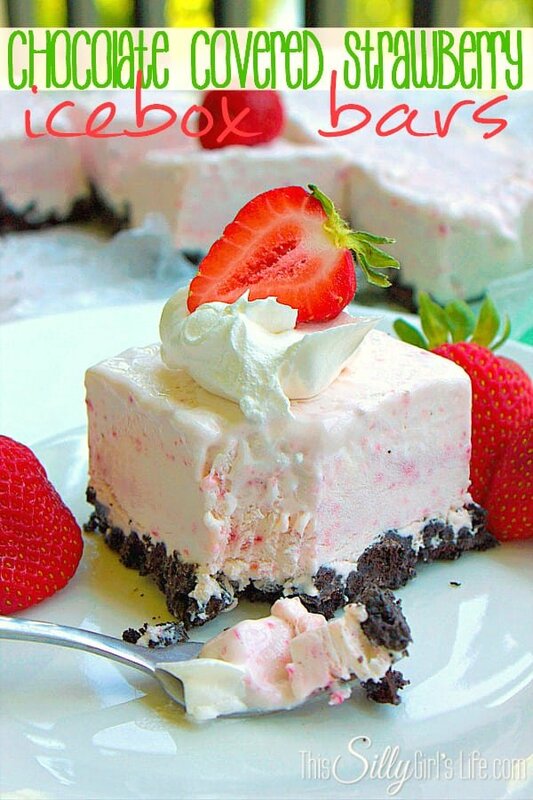 I love love love strawberries… and cream cheese… and oreos… so let’s just smush that all together, shall we? That’s what’s in these amazing chocolate covered strawberry icebox bars! So easy too, no baking required… perfect for summer! Ahh it’s so cold and refreshing, I love the fresh strawberry taste! 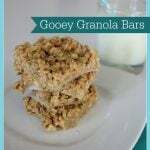 I got the inspiration for these icebox bars from Tastes of Lizzy T’s Pink Lemonade Icebox Pie Squares. 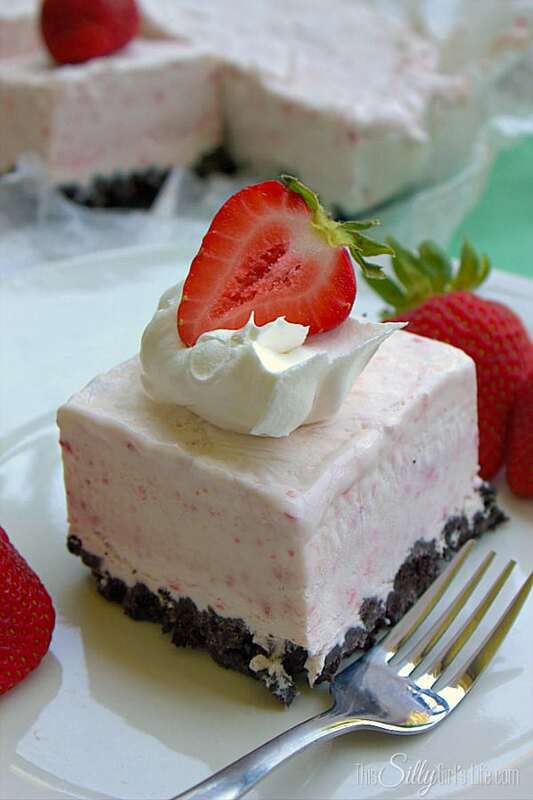 I love love love strawberries... and cream cheese... and Oreos... so let's just smush that all together, shall we? 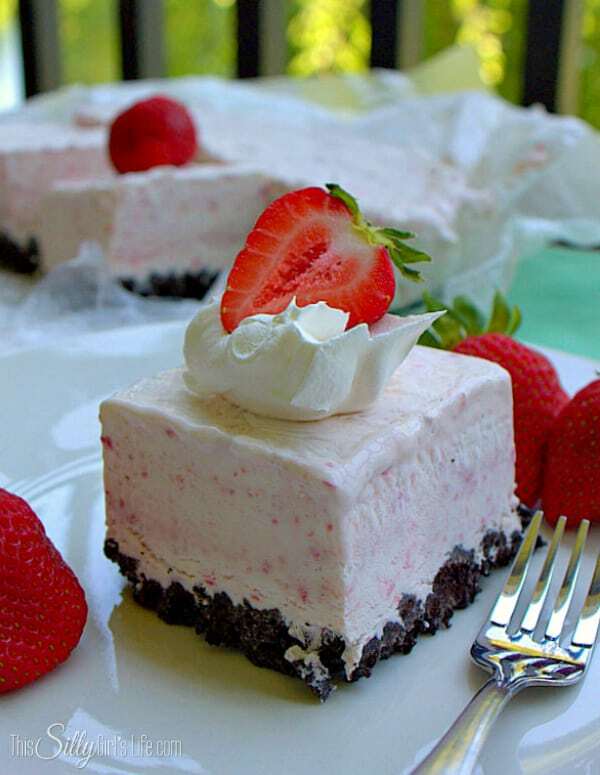 That's what's in these amazing chocolate covered strawberry icebox bars! Line a 8x8 pan with parchment or wax paper. 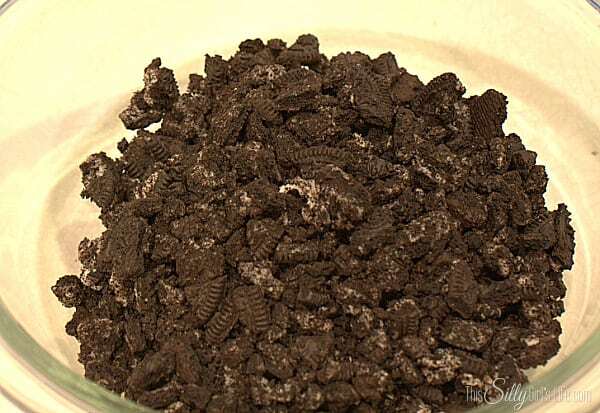 Crush oreos and mix with butter, I used my hands to mix and then press into the bottom of the pan. With a hand mixer, cream the cream cheese for 2 minutes, until light and fluffy. 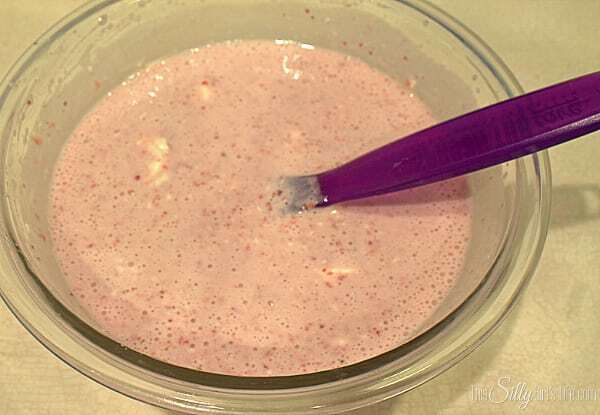 Add in the sweetened condensed milk and strawberry puree. Mix until smooth and combined. Fold in the whipped topping. Pour on top of the crushed cookies and place in freezer until set about 5-6 hours. Cut into bars and enjoy! 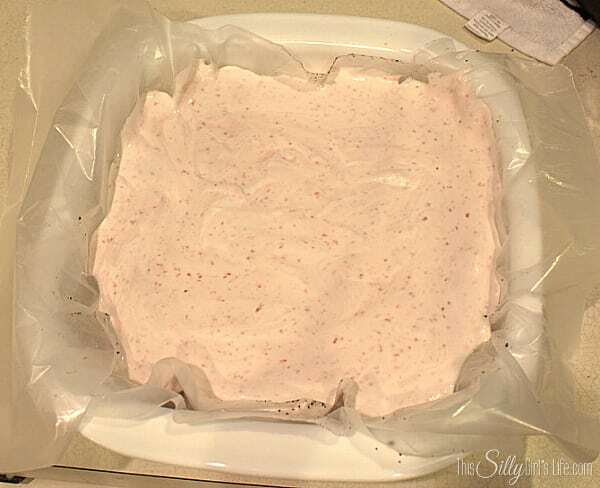 Line a 8×8 pan with parchment or wax paper. Crush oreos and mix with butter, I used my hands to mix and then press into the bottom of the pan. With a hand mixer, cream the cream cheese for 2 minutes, until light and fluffy. Add in the sweetened condensed milk and strawberry puree. Mix until smooth and combined. Pour on top of the crushed cookies and place in freezer until set about 5-6 hours. 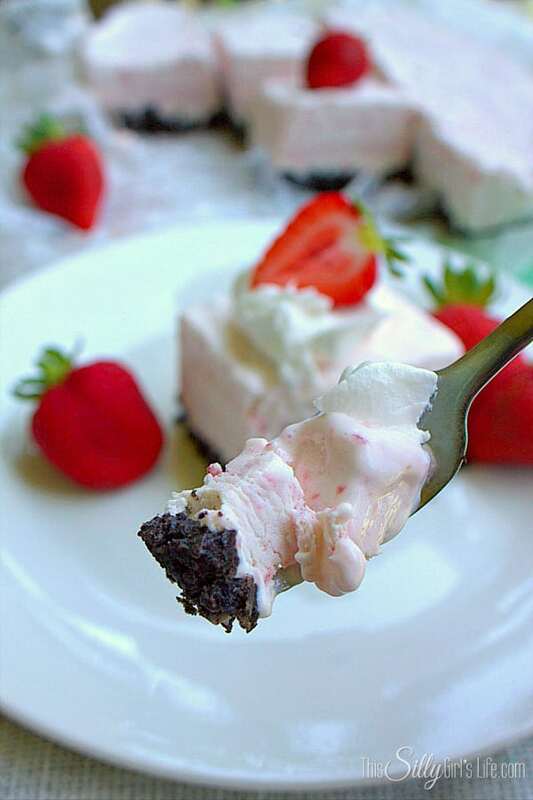 Yummy, you will love the taste of a chocolate covered strawberry in this frozen dessert! 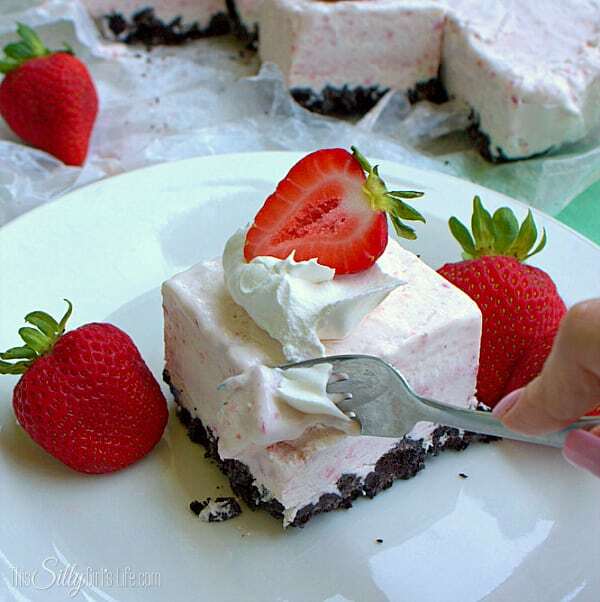 Icebox pies are the best dessert for summer, in my opinion! It is a little hard when it first comes out the freezer so let it set out for about 5 minutes and it’s ready to eat! Also, icebox pies or bars are perfect for parties, you can make it in advance… up to a month even! 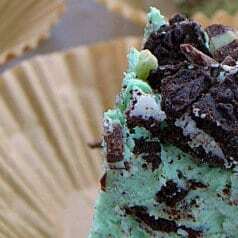 What is your favorite frozen dessert? Do you have any requests I can make for you for this series!? 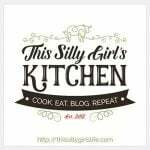 I’m all ears, leave a frozen dessert you would like to see from me in the comments and I just might make it for you! Don’t forget to check out Parrish’s weekly series recipe for Golden Oreo Banana Pudding Pops! My husband loves chocolate so he requested a rocky road ice cream cake. 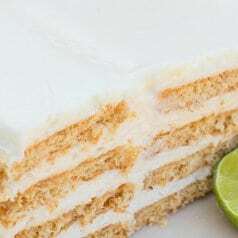 I would like to make this, please send me the recipe. The recipe is on the blog post above these comments. This looks amazing! 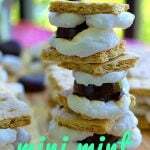 I want some right now!! Pinning it! Oh boy, i just want to dive right in! These bars are beautiful, so tall with lovely edges. I bet they taste amazing too. Mmm looks so good! Definitely agree about it being perfect for summer! Thanks for the recipe! 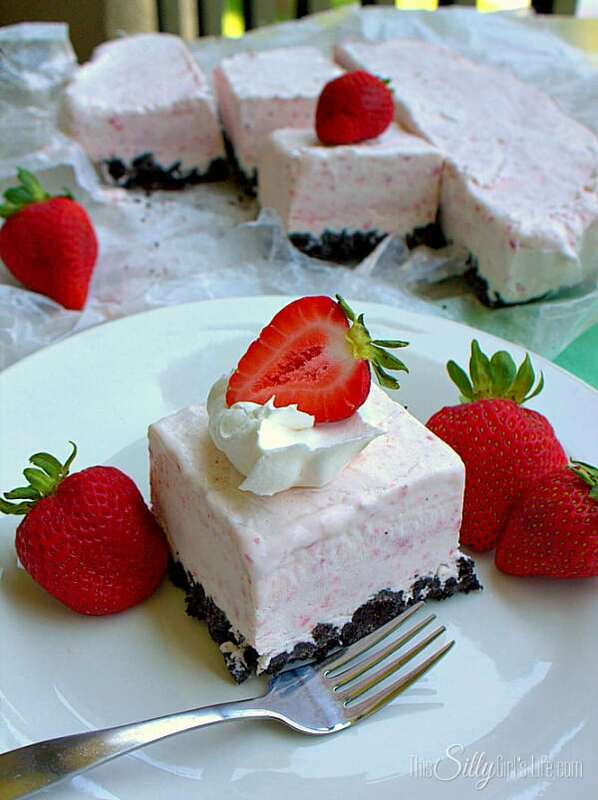 This looks perfect for a summertime dessert! And I love being able to use fresh strawberries in the mix. Thanks for sharing on Cast Party Wednesday. Girl! You’re killing me with all of this yummy-ness. Thanks so much for partying with us each week. Have a lovely 4th of July weekend. Hugs! Melt in the mouth deliciousness! Adding it to my summer list. 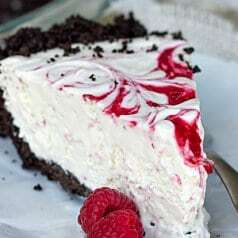 mmmmh this look so amazing, i will definitely try it, thanks for the recipie. Looks so yummy! But chocolate covered? Did I miss something? “Chocolate Covered” is just a play on words with this dish. Same flavors as chocolate covered strawberries.